Shop Doctor Who - Page 122 of 125 - The Place to shop for Doctor Who gadgets. 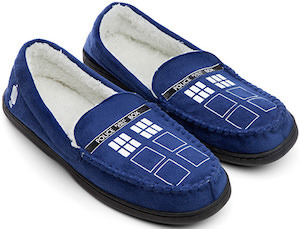 This is the ultimate Doctor Who sleepwear. The shirt is short sleeve and blue and on that you can see the the silhouette of Doctor’s 9, 10, 11 and 12 and behind them it says “Trust Me” and below them it says “I’m The Doctor”. And then there are the pajama pants that are black but they are covered in the same picture of the last 4 Doctor’s and in white the text “Trust me I’m the Doctor”. So now you can dream away in these amazing Doctor Who pajamas and as it is a set you can just drop everything and be comfortable in your Doctor Who sleepwear. You can get this Doctor Who pajama set in sizes Small – 2XL and yes of course men and women can wear them. Come take a closer look at this Doctor Who Trust Me I’m The Doctor Pajama Set. This night light is special as it has you name on it. This Doctor Who themed night light is specially made for you. First it shows the name of the owner and then below that you can see the Tardis. And all that lights up when it’s dark. And yes this Doctor Who night light has a sensor build in so that it knows when it’s dark and then it just turns on for you. Just like the Tardis this night light needs very little power and will last a long long time. And if blue is not your color then don’t worry it comes in different colors to. 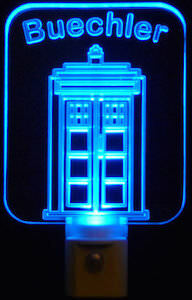 And if you are looking for a special present for your favorite Doctor Who fan then this night light could be perfect. Why get a generic night light when you can have your own Doctor Who Personalized Tardis Night Light. Kids like Doctor Who to and for those kids there now is a special piece of sleepwear available. 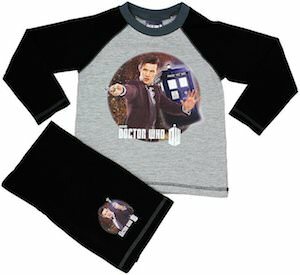 This pajama has long pants and long sleeves and on the shirt you can see the 11th Doctor holding out his Sonic Screwdriver while the Tardis is hanging in the back. And yes of course this pajama also say Doctor Who and shows the logo. And on the pants you can also see Matt Smith as Doctor Who holding up his Sonic Screwdriver. Just imagine the kids amazement when they see these amazing Doctor Who pajamas. The pajamas come in different sizes and are made from 100% cotton. Make the kids dream about the Doctor while wearing this Doctor Who 11th Doctor Kids Pajama Set. Now there is the perfect pair of pajamas for women. This Doctor Who pajama set has blue pants with the Doctor Who logo that looks like the Tardis printed all over it. And then there is the shirt that looks like the Tardis complete with windows and door signs and of course the “Police Public Call Box” sign on top. But the pajama top does more. When you give the shirt light in the day then it will glow at you at night. The Tardis windows will light up in the dark making it fun and different. These women’s Doctor Who pajamas are made from 100% cotton and come in sizes Small, Medium and Large. Come and take a look at this fun Doctor Who sleepwear and then order you own pair of Doctor Who Women’s Pajama Set. This snapback hat brings back memories of Rose and the Doctor. 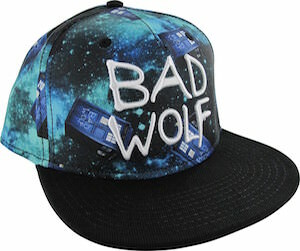 This Doctor Who baseball cap has a black visor and the base is all covered with pictures of the Tardis flying through space and yes on the Tardis the words “Bad Wolf” are painted. And besides all that on the front it also has “Bad Wolf” on the hat. This Doctor Who hat is great for men and women and because it is a snapback hat it is easily adjusted to fit you right and that makes this Doctor Who cap perfect for almost anyone. A t-shirt with a Weeping Angel on the back has one advantage, you can’t see it so you don’t have to worry about blinking. People walking behind you on the other hand should definitely not blink. 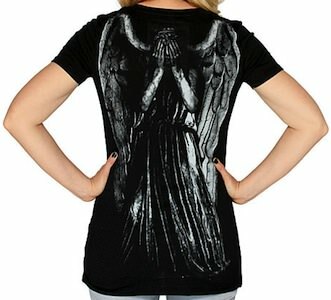 So this is a black v-neck women’s t-shirt and shows a covering picture of a Weeping Angel on the back. 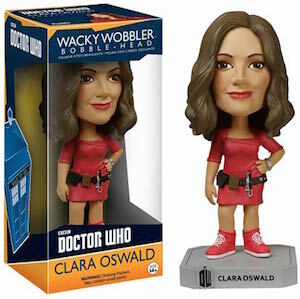 This design looks great and surely makes any Doctor Who fan stare at the Angel on the back but that also means that they will keep staring at you back as they can’t blink. On the front of this Weeping Angel t-shirt it says in a bottom corner the words “Don’t Blink” and that is a wise advise for people that are gone watch your back. This Doctor Who Weeping Angel t-shirt is available in sizes Small to 3XL. Doctor Who fans that want something special should check out this Doctor Who Weeping Angel T-Shirt. Is Doctor number 10 your favorite? If it is then why are you not wearing this girls t-shirt that shows a silhouette picture of the 10th Doctor Who while wearing his famous coat and 3D glasses? 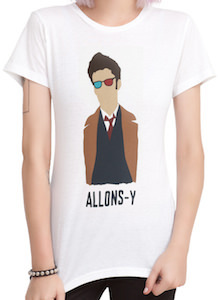 And if the picture on this Doctor Who t-shirt is not good enough then the text below it makes it even better and yes it says “Allons-y” the one word used by the Doctor we all remember. This Doctor Who t-shirt comes in junior sizes XSmall – 3XL and is made from 100% cotton. And this t-shirt may not be the obvious Doctor Who t-shirt for average people but a true Doctor Who fan knows exactly what it is about. Was Doctor number eleven you favorite? If it was then you should take a look at this women’s t-shirt. This white t-shirt shows a silhouette of the 11th Doctor complete with a bow tie. But the Doctor Who t-shirt does not have a face making it something a fan of Doctor Who will recognize. And below the Doctor you can find one of his famous words “Geronimo”. This 100% cotton t-shirt comes in junior sizes XSmall – 3XL. A t-shirt like this is special. It is not a clear Doctor Who t-shirt and that makes it more special for you who knows what it is. 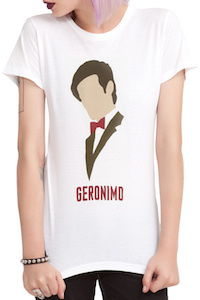 Come take a closer look at this Doctor Who 11th Doctor Geronimo Silhouette T-Shirt. Some fun pajama pants are great to sleep in or to just lounge around the house. If you are a fan of Doctor Who and England then you may like these pajama pants. 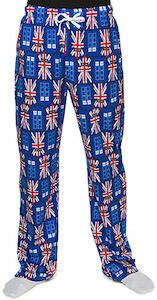 The pants are blue and shows the Tardis and Union Jack flag next to each other over and over again until the whole pants are covered in this typical Doctor Who design. And these Tardis pajama pants are made from 100% jersey knit cotton and have an elastic waistband with drawstring. And yes these pants come in men’s sizes Small – 3XL and they look great on girls too. This black infinity scarf is perfect for Doctor Who fans that want something around their neck. The scarf is black and cover in picture of the Tardis and these images have colors on them like blue, red and white and together they look like the Union Jack flag of Great Britain. This officially licensed scarf is great for any day of the year as it works great as just an accessory or to actually keep you warmer in winter. 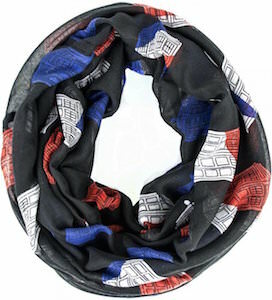 Doctor Who fans that need a scarf don’t have to look any further then this Doctor Who Union Jack Tardis Infinity Scarf.